We’ve all heard of Kentucky Fried Chicken, but there is so much more to this state than delicious poultry. Kentucky is home to the world’s longest cave, the world famous horse race – the Kentucky Derby, and bluegrass music. Kentucky is the 4th largest state for automobile production, with several Ford, Toyota, and Lexus models built here. For you drinkers out there with refined tastes, you’d be glad to know Kentucky produces 95% of the world’s bourbon whiskey. With so much going on in the state, you can understand why there are many cities here that have high safety ratings. There is a large concentration of cities with high safety ratings to the north, near the Ohio border. Cities like Fort Thomas, Erlanger, and Independence are here, all with safety ratings above 80. On the national level, there are 4 cities in Kentucky that made it onto the top 750 safest cities in the nation. These cities have seen declines in their property crime rates over the years. The safest city is Fort Thomas, with a safety rating of 89.83, and it is right on the Ohio River with a population of 16,358. The median income for a family here is $63,006, which is on the upper end in Kentucky. Fort Thomas has great education for those under 18, and ample job opportunities, both contributing to the high safety rating of the city. 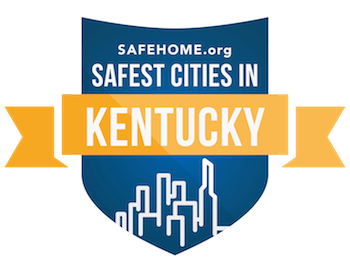 Deeper into Kentucky are many other safe cities to choose from, such as Danville (86.74), and Lexington which has one of the biggest populations in the city with 314,077 residents and a safety rating of 68.86. The largest population is just west of Lexington, in the Louisville Metro area. There are 680,550 residents in Louisville Metro, with a safety rating of 65.92, not at all bad for such a highly populated area.